NEW YORK, Jul 10 2012 (IPS) - New York State legislators up in Albany are likely to be seeing a lot of Librada Paz in the near future. The farmworkers’ rights activist was recently chosen as the 29th recipient of the annual RFK Human Rights Award, marking the beginning of a six-year partnership between Paz and the Robert F. Kennedy Center for Justice and Human Rights to further her advocacy for just working conditions for farmworkers and the recognition of additional exploitation women face in the fields daily. “The judges were extremely impressed with her, and excited about the possibility of making a difference with our support,” Santiago Canton, director for the Human Rights Program of the Washington D.C.-based RFK Center, told IPS. The future partnership with Paz and her organisation, Rural Migrant Ministry (RMM), will include financial support and human resources for advocacy campaigns to get farm workers equal protection under New York State’s Labor Relations Act. Currently, farm labour is excluded from this law – which grants other New York State workers such rights as a day of rest, sick leave, paid overtime and collective bargaining – leaving it up to farmers to decide whether or not to extend such rights. 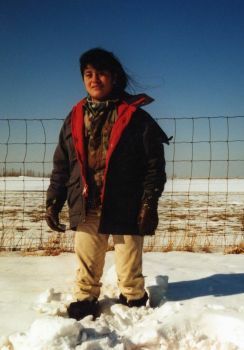 Paz migrated from Mexico to the U.S. at age 15, along with her sister, where she joined her two brothers working 14-hour days on farms in Florida, California and New York. For the next 15 years, she experienced first hand many of the conditions she today addresses in her work for RMM, a non-secterian organisation educating and advocating for farmworkers across New York state. Having obtained a college degree and her citizenship, Paz quit the fields in 1998 and has since poured her energy into lobbying for such initiatives as the Farm Workers Fair Labor Practices Act – a bill that has won the backing of other civil society organisations, like the New York Civil Liberties Union (NYCLU). She’s eager to stress that “not all farmers are bad”, but that protections ought to be in place for those workers who are currently being exploited by the rotten apples in the industry. “People are being fired because they get sick. And people get sick because they don’t get a day of rest,” she said. Her organisation further seeks overtime pay for work “above 50 or 60 hours a week”, which is a standard workweek for farmworkers, according to Paz. In addition to across-the-board farm labour conditions, which Canton calls “horrendous” and “anachronistic” in most of the U.S., women face additional discrimination, ranging from difficulties securing farm work to endemic sexual abuse. Paz’s award closely follows the recognition of another farmworker rights activist, Dolores Huerta – cofounder of the United Farmworkers with Cezar Chavez – who received the Medal of Honor from U.S. President Barack Obama in May. Both choices mark a strong recognition of women’s involvement in the fight for equal labour rights of farmworkers and the additional discrimination they encounter. The RFK Center, which announced the decision last week, chose Paz out of 34 nominees to enter into a partnership. The centre will provide up to 30,000 dollars in financial assistance and one staff person at the centre who will fully dedicate their time to working with the award winner on a strategy they design and execute over the next six years, according to Canton. In recent years, the Robert F. Kennedy Center has recognised and supported the work of Ugandan LGBTQI-activist Frank Mugisha and Mexican advocate for indigenous rights Abel Barrera Hernández, among others. Paz admits she wasn’t aware quite how big of a deal the award was until she won it and did some research. The award will officially be handed to Librada Paz during a ceremony in Washington D.C. in November.